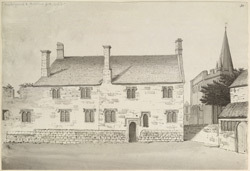 A view in ink of the hospital opposite Christ Church Gate in Oxford, drawn by S.H. Grimm. Oxford in medieval times was well served by hospitals. There were several foundations, the most well known are St Bartholomew's (f.1129), St John the Baptist (f.1231) and others we know relatively little about such as, St Clements (14th century) and St Giles (14th century) and St Peter's (14th century). Hospitals were often in marginal locations, on the town outskirts or outside the medieval walls. As their names suggest, they were always religious foundations, run by monastic orders. As such, many of them did not survive the dissolution of the monasteries in the 16th century.